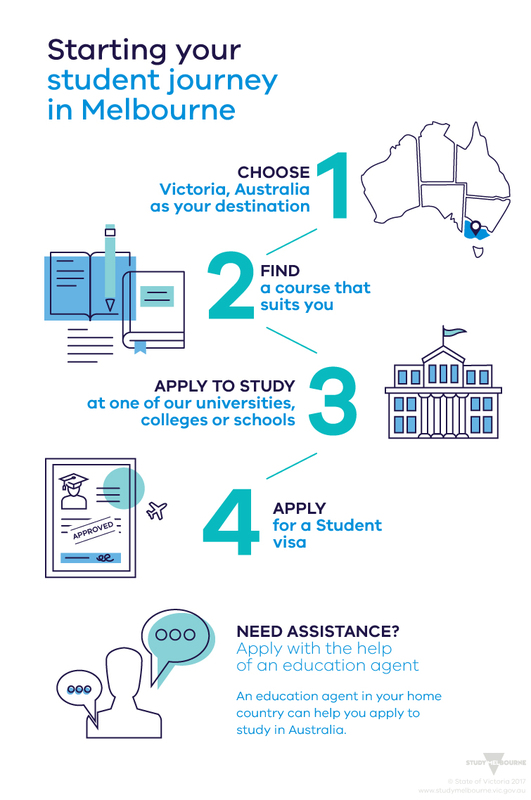 Choose a course, apply for a visa and start your Victorian study journey. How Carolina went from intern to student - and loves her Melbourne life! Before you start your study in Australia you must make two applications. Apply to the Australian government for a student visa. Apply to the university, college or school where you want to study. You can also download a PDF version of this infographic (PDF 2314 kb) for printing. Your journey to study in Australia starts with choosing a university, college or school where you want to study. Find out more about the top reasons why Melbourne is a great destination for international students. Find the best university, college or school for you by going to information days and research on the internet. Talk to friends and other people who have studied here. Why not connect to our Facebook page to see how other students have made Melbourne and Victoria their home. When you apply to study at a Victorian educational institution such as a university, college or school, they will ask you to provide documentation such as proof of identity and transcripts of study that you have done before. Your documentation must be in English. If your original documents are not in English, arrange an authorised translation as well as the original or a certified copy of the original. When the university, college or school you applied to accepts your application they send you a letter of offer or electronic confirmation of enrolment (CoE). You need this document when you apply for a Student Visa. Visit the Student visa (subclass 500) page on the Department of Home Affairs website. If you're already living or working in Australia, you may be able to apply to study here as an international student. An education agent in your home country can also help you with applying to study in Australia. Universities, colleges and schools often keep a list of agents they have appointed. Usually the list is published on their website. If you already know where you want to study, check the website of the university, college or school to see if there's an education agent near you. Find out more about How to find an education agent. Caroline is from Mexico. She was here as an intern and loved it so much she applied to study. Carolina says, 'Studying here is just great. It's been a great experience'. See more videos like this on the Study Melbourne YouTube channel.